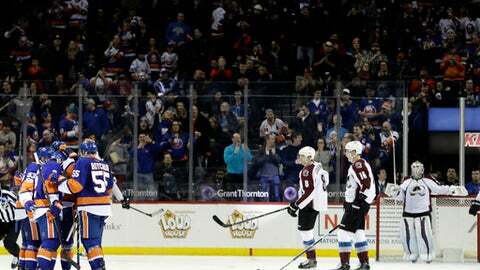 NEW YORK (AP) Just a month ago, the New York Islanders were mired in last place in the Eastern Conference. Their best stretch of the season now has them just a point out of a playoff spot. Anders Lee scored two of New York’s three third-period goals to lead the Islanders to a 5-1 victory over the league-worst Colorado Avalanche on Sunday night. New York won for the third time in four games and improved to 10-3-2 in the last 15 to pull one point behind Toronto and Philadelphia for the second wild-card spot in Eastern Conference. The Islanders visit the Maple Leafs on Tuesday night. Nick Leddy had a goal and two assists, Ryan Strome and Jason Chimera also scored and Tavares and Johnny Boychuk added two assists each. Jean-Francois Berube stopped 25 shots in his fifth start of the season as New York improved to 7-0-2 in its last nine at home. Joe Colborne scored for Colorado and Calvin Pickard finished with 28 saves. Colorado coach Jared Bednar pointed to his team taking eight penalties and giving up five power-play chances – including a two-man advantage in the second period – as a big reason for his team’s loss. The Islanders scored twice on those chances. With the Islanders ahead 2-1 after two periods, Lee put them ahead by two just 1:21 into the third as he got a pass across in front from Tavares and put it in from the right side. Lee made it a three-goal game when he scored from the left side on a power play for his 21st with just over 8 1/2 minutes to go. Chimera added his 13th for a 5-1 lead with 6:12 remaining. It was his eighth goal in the last 15 games. With Colborne off for boarding, Colorado’s Fedor Tyutin was whistled for high-sticking Tavares with about 5 1/2 minutes to go in the second period to put New York on a 5-on-3 for 26 seconds. The Islanders took a 2-1 lead just 18 seconds later as Tavares sent a pass across from the right dot to Strome, who fired it in from the left circle with 5:14 remaining in the middle period. Colborne got the Avalanche on the scoreboard at 8:12 of the first period as he got the puck in the high slot, skated in on Berube and deked a backhand before putting a forehand in. It was Colborne’s fourth of the season, but first since a hat trick in the season-opening win against Dallas on Oct. 15. Leddy tied it at 1 when he wristed a shot from the left side beyond the left circle that got past a screened Pickard for his ninth with 7:59 to go. Berube’s best save of the period came on a one-timer from John Mitchell from the right circle that the goalie stopped and then smothered with about 3 1/2 minutes remaining. NOTES: Colborne, signed as a free agent in the offseason, had an assist at Tampa Bay on Oct. 20 in the fourth game of the season, but no points in the next 38 games. … Colorado fell to 2-26-1 when trailing after two periods. The Islanders improved to 18-0-4 when leading heading after 40 minutes. New York is also now 24-5-3 when scoring at least three goals. … Leddy’s assist on Strome’s goal in the second period was his 200th career point. … New York will play 18 of its last 27 games on the road, where it is 7-11-4. Avalanche: At New Jersey on Tuesday night in the middle game of a season-high five-game trip. Islanders: At Toronto on Tuesday night.